Researchers at Rice University in Houston, Texas, have developed a nanoporous material that has the energy density (the amount of energy stored per unit mass) of an electrochemical battery and the power density (the maximum amount of power that can be supplied per unit mass) of a supercapacitor. It's important to note that the energy storage device enabled by the material is not claimed to be either of these types of energy storage devices. The research community has wearied of claims that some new nanomaterial enables a “supercapacitor," when in fact the energy storage device is not a supercapacitor at all, but a battery. However, in this case, the Rice University researchers, led by James Tour, who is known for having increased the storage capacity of lithium-ion (Li-ion) batteries with graphene, don’t make any claims that the device they created is a supercapacitor. Instead it is described as an electrochemical capacitor with nanoporous nickel-fluoride electrodes layered around a solid electrolyte that is flexible and relatively easy to scale up for manufacturing. The issue of appropriate nomenclature aside, the reported performance figures for this energy storage material are very attractive. In the Journal of the American Chemical Society ("Flexible Three-Dimensional Nanoporous Metal-Based Energy Devices"), the researchers report energy density of 384 watt-hours per kilogram (Wh/kg), and power density of 112 kilowatts per kilogram (kW/kg). To give some context to these numbers, a typical energy density for a Li-ion battery is 200Wh/kg, whereas commercially available supercapacitors store around 5- to 25 Wh/kg and research prototype supercapacitors have made claims of anywhere from 85 to 164 Wh/kg. In terms of power density, the numbers for the new nanoporous material is in line with those of supercapacitors, which range from 10 to 100 kW/kg—far higher than the 0.005 to 0.4kW/kg that batteries can deliver. 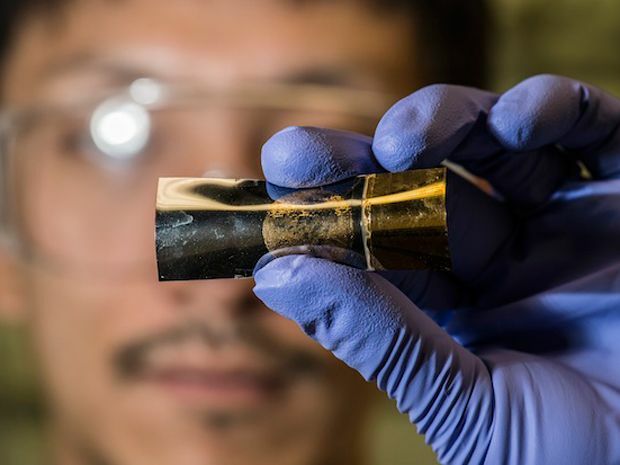 To make the battery-supercapacitor hybrid, the Rice team deposited a nickel layer on a backing material. They then etched the nickel layer to create pores five nanometers in diameter. The result is high surface area for storing ions. After removing the backing, the nickel-based electrode material is wrapped around a solid electrolyte of potassium hyrodroxide in polyvinyl alcohol. In testing, the researchers found that there was no degradation of the pore structure after 10 000 charge-discharge cycles, or any significant degradation of the electrode-electrolyte interface. With the device’s flexibility and high charge-up rate, it’s possible to imagine this storage device powering flexible mobile devices. However, charging rates for the battery/supercapacitor will be limited by the typical 200-amp 240V single-phase residential service, which is only capable of providing (absent any other load) only 48 kW. If I read that right it looks like it nearly doubles the energy of a lithium battery (which itself is nearly twice the energy density of the LiPolys we normally use. And it sounds like it has an astronomical C rate so you end up with a battery that contains 4 times the power per unit weight of what we are currently using and with a discharge rate that seems like you could use it to power a hand held rail gun. Great for our hobby, but with that kind of power and instantaneous energy available the potential for truly spectacular failures might be an issue. In any case I hope this technology proves to be rapidly commercially feasible, they can always fuse it in such a way internally as to prevent major fireworks. Indeed, what could possibly go wrong. For quick reference, here is a list of links to other DIYD blog posts about advancements (or potential advancements) in battery technology.